This picture probably does not mean a lot to most, but as I was flipping through my pictures, I came upon this. I learned later that my sister took it, but I was thinking yesterday about how I had so much fun yesterday at Fun Run, and I didn't understand why it was so much fun this year! I know the kids are getting older, so they are easier to manage. Tyler, keep your fingers crossed, is developing the amazing sense of humor, so she is actually enjoyable to be around. 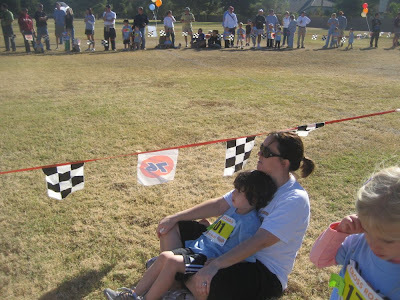 However, when I happened upon this picture, I realized that I didn't volunteer to be part of Fun Run AT ALL this year. I came to the event, I watched the event, my almost four year old ACTIVE child SAT ON MY LAP, and I just got to enjoy the food and company of friends and family. I am not one to sit on the sidelines often. I am on the Preschool Board, I like to be involved, but I did really appreciate the time out yesterday! Hooray for saying NO! That's pretty bad coming from a fellow board member isn't it!